Is your carpet dingy and dull with a flattened grey look in high traffic areas? Does it never quite look clean not matter how often you use the vacuum? Do you have carpet stains that mar your floor's appearance? A newly vacuumed, clean and bright carpet creates a welcoming appearance and an impression of a well-maintained, thriving establishment. But after a few months of day to day foot traffic, the outdoor dirt and grit can really start to get ground deep into the carpetsfibers. No matter how much you pass the vacuum cleaner over your carpets, they will never quite looks as good as they once did. Most carpet manufacturers recommend annual cleaning to maintain your carpet's appearance and durability. In fact, some manufacturers insist on professional carpet cleaning every 12 months to keep the warranty valid. If your carpets do not offer the attractive appearance you would like, this is the moment to call in New York's carpet cleaning professionals from CLA Commercial Cleaning to restore your carpet's look to the dayit was installed. With CLA's state of the art equipment and innovative steam-cleaning techniques we can gently remove the ground in silts, grit and other abrasive debris that are flattening your carpet fibers and leaving that dull, grey look. We can also remove most types of stains and pollutants, leaving your carpet smelling and looking bright and fresh – and prolonging its durable life. 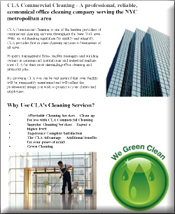 Call CLA Commercial Cleaning at 646-532-3750 to find out more about our affordable cleaning services for carpets, windows, offices, businesses, residences, and our floor waxing and refinishing, janitorial, and superintendent services too for the New York or Tri-State area. We offer FREE estimates and NO-OBLIGATION walk-throughs.